D-Link, the industry pioneer in wireless networking, introduces another breakthrough in wireless connectivity — the D-Link AirPremierAG DWL-AG530 Wireless PCI Adapter. 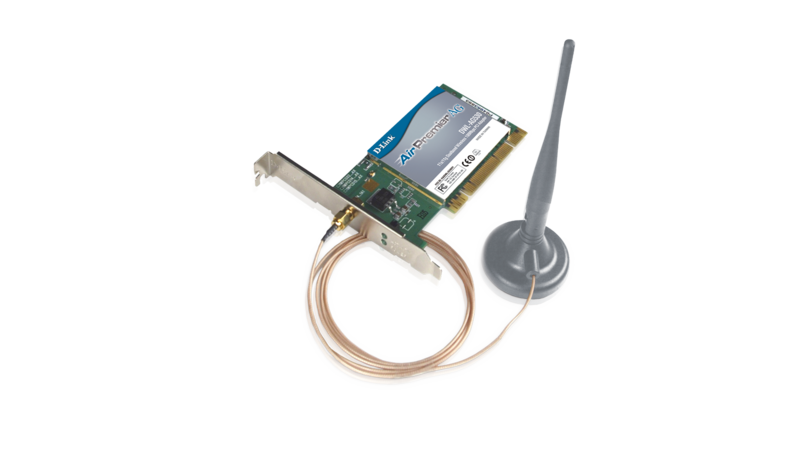 This tri-mode, dualband adapter gives your desktop PC a versatile way to wirelessly connect to any one of three available wireless networks — 802.11b, 802.11g and 802.11a that operate in two discrete, noninterfering frequency bands: 2.4GHz and 5GHz. D-Link, the industry pioneer in wireless networking, introduces another breakthrough in wireless connectivity — the D-Link AirPremierTM AG DWL-AG530 Wireless PCI Adapter. This tri-mode, dualband adapter gives your desktop PC a versatile way to wirelessly connect to any one of three available wireless networks — 802.11b, 802.11g and 802.11a that operate in two discrete, non-interfering frequency bands: 2.4GHz and 5GHz. If you are a network administrator, the versatile 802.11a/b/g-compatible DWL-AG530 expands your existing wireless network and protects your overall network investment. By installing DWL-AG530s in desktops throughout your organization, your employees can access wireless APs or routers from their desktop PCs. As your company expands or reorganizes you won't need to spend time and resources re-cabling Ethernet wires because wherever the workstation is relocated to, it will still be wirelessly connected to the network. When you add an 802.11a/b/g access point (D-Link AirPremier AG DWL-7100AP) or router (D-Link AirPremier AG DI-784), to your wireless network, you will have an complete wireless solution. With the enhancement of D-Link 108AG, the DWL-AG530 can transfer data with a maximum wireless signal rate of up to 108Mbps* in a pure D-Link 108AG environment through the use of new wireless technologies such as Packet Bursting, FastFrame, Compression & Encryption, and Turbo mode. This provides bandwidth large enough to handle video/audio streaming and Video on Demand (VoD) applications. The additional (802.11a) 5GHz band also offers a way to quickly transfer data in a frequency range that does not usually experience interference or interruptions. WPA (Wi-Fi Protected Access) and 802.1x user authentication are both integrated into the DWL-AG530 chipset to offer enhanced security so employees can communicate with colleagues confidentially or access sensitive data. The DWL-AG530 is a high-performance, versatile PCI adapter meant for anyone who needs to connect their desktop PC to a wireless network whether at home, at school, or at the office. * Maximum wireless signal rate derived from IEEE Standard 802.11a and 802.11g specifications. Actual data throughput will vary. Network conditions and environmental factors, including volume of network traffic, building materials and construction, and network overhead, lower actual data throughput rate. Environmental factors will adversely affect wireless signal range. This software may be used only for the specified product, pay attention to particular hardware revision, eg: H / W B2, or Rev. A3! Used in a different / similar product can make this product unusable and will void your product warranty.